According to a recent article in Transport Topics, the trucking industry has yet another reason to celebrate as the latest sales figures from the month of May have come in. Class 8 trucks sales saw a total jump of 20 percent compared to their sales from last year: 21,501 units compared to 17,990. So what accounts for this continued success, and how likely is it that it will continue in the months to come? Read on to find out. Where Can My Sprinter Van Be Serviced? Whenever your Sprinter Van is off the road, it means that you are losing money. 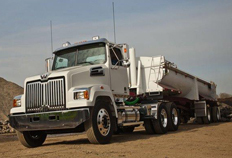 At Baltimore Freightliner-Western Star, we realize how important it is to identify a problem. We also know, however, that is just the first step. You need the right Sprinter parts and services to get your van back on the road, so we take great pride in providing a comprehensive service. We know your van is the lively hood of your business, so we want to keep you updated with the recovery of your Sprinter Van every step of the way. Whether you personally bring in your van or have it dropped off by a tow truck, we will provide you with a diagnostics report within two hours of the drop-off. Our diagnostics will allow you to gain a general idea of the severity of the problem, which will help you establish alternative arrangements during your van’s repair time. When vehicle issues do arise, you need to have a professional service that has the right parts and services for your Sprinter Van. As the trucking industry continues to see positive results from its new truck sales sector, it has also seen an increase in the number of used commercial truck transactions. In the first quarter of this year, the total number of used truck sales increase by 4 percent. So what factors have contributed to this increase, and how can you take advantage of used commercial trucks in your own fleet? Read on to find out! Trade-ins of used trucks have increased and added a significant number of available used models to the market. Because the quality of commercial trucks has increased steadily over the years, trucks made even several years ago are still in excellent work condition. So while some fleet owners opt for all-new models to add to their fleet, others can benefit from the sale of their used commercial trucks; they still have access to trucks of similar quality that fit realistically into any budget. Why Opt for Used Commercial Trucks?